This past week I was all about Shellfish. That's not so out of the ordinary for me - I'm wild about the stuff. Especially once the warm weather hits, my thoughts turn to Crab Boils and Clam Bakes. For me, Shellfish is just feel-good food - light, simple, and perfect for laid back summer meals with family, friends, and plenty of laughs. 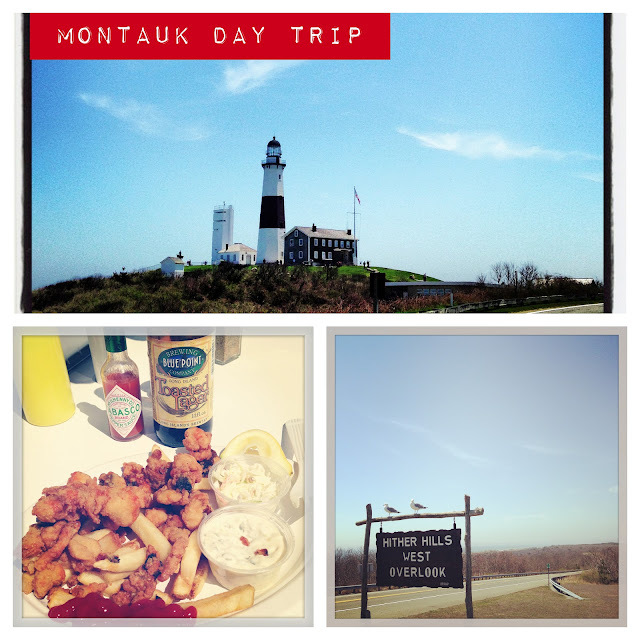 My craving ended up being perfectly timed since we spontaneously decided to head out to Montauk this weekend. 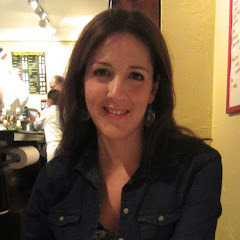 Montauk is a charming seaside town at the tip of Long Island's South Fork. The recipe is surprisingly quick and the result is both delicious and really hard to mess up. A mini muffin tin allows you to skip the messy process of forming and frying up Crab Cakes, and makes it easy to turn out a large amount of appetizers in a few easy steps. Whip these up for a cocktail party or as a light appetizer and you'll be everyone's best friend. A dollop of homemade Mustard Sauce gives these little savory cakes a tangy bite, and fresh chives add both to the taste and presentation. We like to use Back Fin Crab Meat. It comes pasteurized in the can and is cheaper than Lump Crab yet is still extremely flavorful. Generously grease muffin tin with with some Butter. Mix up the Homemade Mustard Sauce if using. * Recipe follows. Using an electric beater, beat Cream Cheese in a medium-sized bowl until smooth. Add 1/4 Cup of the Parmigiana Cheese and the Egg. Beat until combined, Add the Sour Cream, Orange and Lemon Peels, and 2 Tablespoons Chopped Chives. Add the Kosher Salt, Cayenne Pepper and Smoked Paprika. Beat again. Fold in the Crabmeat. This step can be done up to a day ahead and refrigerated. In a bowl, toss Panko Breadcrumbs, remaining 1/2 cup Parmigiana Cheese, and the remaining 2 Tablespoons chopped Chives. Drizzle the Melted Butter over the mixture, tossing gradually until evenly moistened. Press 1 rounded Tablespoon of the Panko mixture into the bottom of each muffin cup. Press a teaspoon into the cups to help form a crust. You can also do this with your fingers. Some Panko Mixture should be left over. Next, spoon 1 heaping Tablespoon Crab Mixture into each cup. 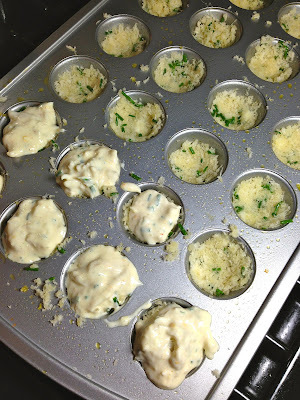 To finish, sprinkle about a teaspoon of Panko Mixture over each muffin cup. Bake Crab Cakes until golden brown on the top and fully set. This should take 30 minutes. When cooked, cool pan for 5 minutes and run a knife around the edge of each muffin cup to loosen the Crab Cakes. Gently lift them out of the pan and transfer to the serving dish. As much as an hour before you are ready to serve Crab Cakes, dot each with a small amount of Easy Mustard Sauce* and garnish with centimeter long slices of Chives arranged in a crisscross shape as pictured above. Serve immediately. ~Mix ingredients together and refrigerate until ready to use. What to do with any leftover Crab? Easy - our Open-Faced Crab Sandwich on thick toasty Bread is a quick, delicious and inspired dinner Sandwich the next day. Pickled Green Tomatoes and ripe Mango create an interesting sweet/salty dimension, and a few drops of Hot Sauce ties it all together with a kick. In a bowl, combine Scallion, Mango, Cucumber, Pickled Green Tomato, and Cilantro. Drizzle with Oil, 1/2 teaspoon Lime Juice, and add a Pinch of Salt. Mix to combine. In a small bowl, combine the Mayonnaise, Lime Juice, a pinch of Salt, a generous sprinkle of Black Pepper, and a few drops Tabasco. Mix. 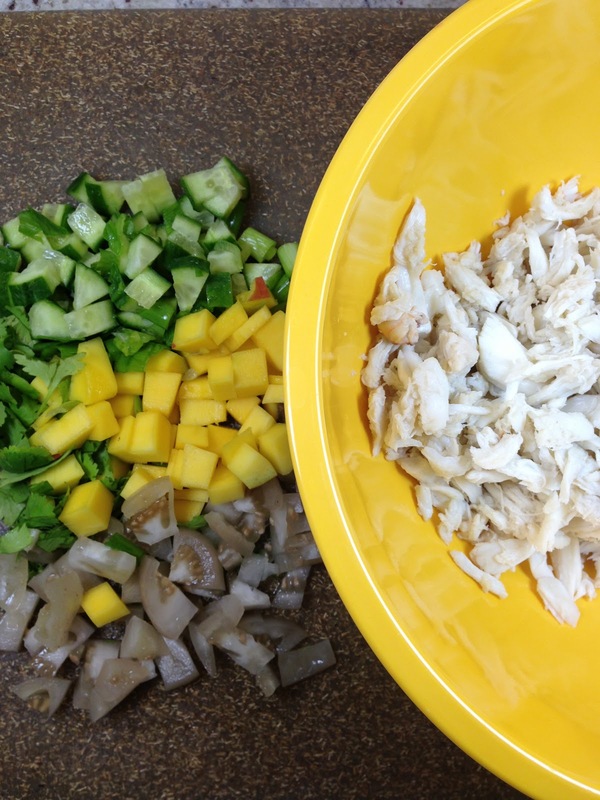 Gently fold the Mayonnaise mixture into the Crab Meat in a larger bowl. To serve, set two pieces of Toast on each plate. Spoon equal portions of the Crab mixture on each piece of Toast. Top with the Mango and Green Tomato Mixture. Sprinkle Generously with Pepper and optionally garnish with an extra slice of Mango. Serve with Lime Wedges for squeezing. Enjoy!